A globally competent student is one who can investigate the world, weigh perspectives, interact with diverse audiences, and take action. To develop these competencies, students need learning experiences that build over time, developing their academic understanding and empathy along with their confidence to take action. That means educators in diverse contexts also need to develop their skills as global influencers. Meet Chelsea Armstrong, Middle-High Principal, and Karen Jacobi, College & Guidance Counselor, at The American School who are helping today’s students seize tomorrow’s opportunities. What are The American School’s (TAS) core philosophy on teaching and its curriculum? Chelsea: Our core philosophy on teaching can be found in our mission statement: The mission of The American School, a private Early Childhood to Grade 12 college preparatory school, is to educate the whole child incorporating mind, body, and spirit. The school provides the tools, opportunities, and human resources to inspire and promote inquiry and development of self-confidence. The students will be equipped to become leaders with inquiring minds through critical thinking, writing, reasoning, investigating, problem solving, and collaborative experiences. A strong partnership of motivated students, caring faculty and parents, affirms and challenges each person within a dynamic American educational program enriched by a multicultural setting in Vietnam. 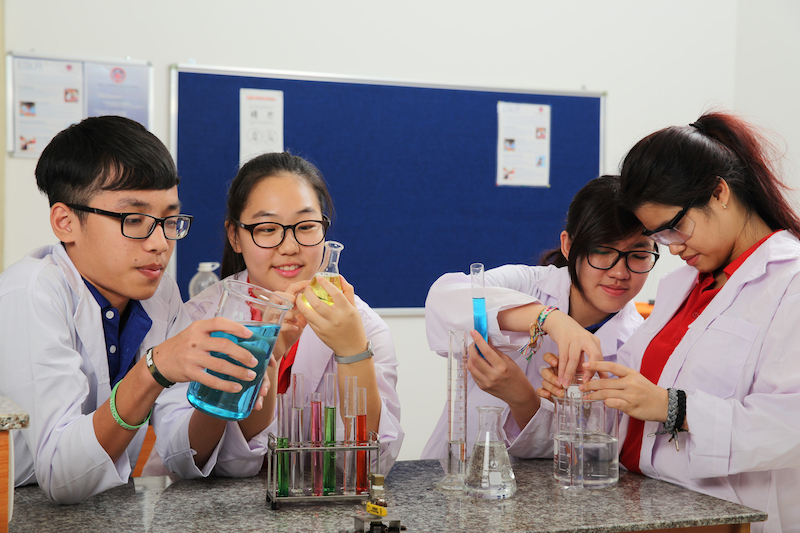 TAS promotes high standards of excellence by enhancing student learning for leadership in a global world. It is incredibly important to us that our students leave TAS as well rounded people ready to give back to the world. Yes, we stress academics, but community involvement, athletics and the arts are equally important to us. We use international best teaching practices to create inquiry based, hands-on, student driven learning experiences to reach the US Common Core State Standards. Karen, describe the role of a school counselor at TAS? What is the counseling theory or approach that you most closely follow? 1. An awareness of both their personal and academic strengths. 2. Researching careers and college/university majors through interest inventories and websites such as College Board’s My Big Future at bigfuture.collegeboard.org. 3. Selecting high school courses that are appropriate to their goals and talents. 4. Understanding the importance of grades and assessments including PSAT, SAT, TOEFL, IELTS, PTE and assisting students in finding resources to make the most of their abilities. 5. Meeting with college and university representatives at local education fairs and asking good questions regarding application requirements, specific majors and programs offered, scholarships and costs, university size, demographics/diversity and student life. 6. Preparing a résumé that details student achievement and extracurricular activities. Résumé help teachers in writing letters of recommendation and help students with the university application process. 7. The nuts and bolts of university applications including The Common App, and other state specific application websites and meeting all deadlines while maintaining good grades in the final year of high school. 8. Finally, the visa process and planning for the next big life adventure. Saigon is a community growing in diversity with many nationalities. Explain how TAS reaches out to people from various demographics to ensure all students and community members are included in learning. Chelsea: TAS has a diverse student and teacher population. It is deeply important to the school that all members of our community feel safe and accepted within the school. We create this sense of comfort through our advisory program, a daily meeting session where all students are placed in small groups of fewer than 10 and are paired with one teacher advisor. Kindness, tolerance, social skills, team building, and other topics are discussed in this safe space. TAS also works to include our parents through newsletters and monthly parenting classes offered by our counseling team. Karen: Cultural differences in an international school setting are a given. 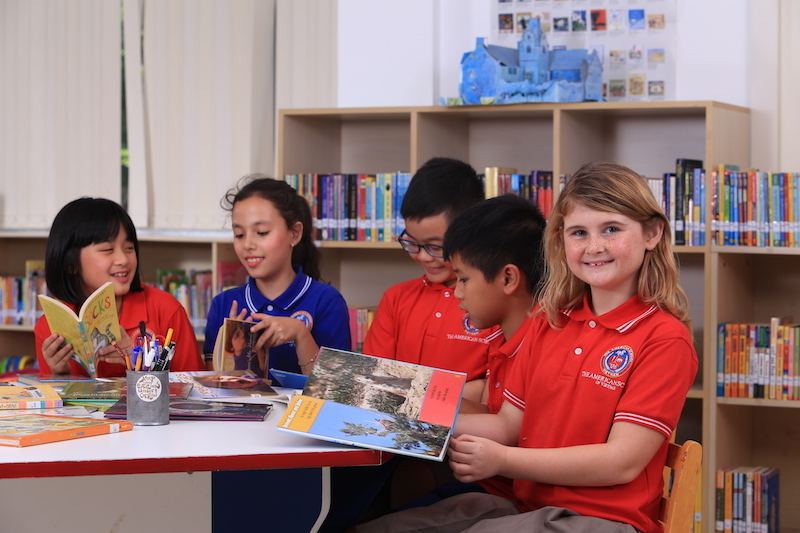 The students at TAS are positive role models for the adults in that most of them have been immersed in cultural exchange since they were very young and focus on the similarities rather than the differences between people. A significant percentage of our students are “third culture” kids—those who are living in a culture that is not native to them and being educated in an American curriculum. Language can be the biggest hurdle and TAS students receive support through dedicated ESL teachers. By the time students reach grade 10, they are expected to have reached a level of English competency that places them on par with their peers in North America. With the exception of Vietnamese culture and foreign language classes, all of the instruction is delivered in English by native Englishspeaking teachers. We have an amazing local staff who work with teachers and administrators when we need to bridge the gaps in communication with parents. What does a WASC accreditation mean for a school? What happens if a student in middle school attends a nonaccredited school and wants to transfer to TAS? Chelsea: WASC accreditation is deeply important to our school. The accreditation process keeps our team continually growing and seeking out ways to improve and be the best school we can for our students. Our accreditation status allows graduates access to colleges and universities in North America, Canada, Europe and Australia. If a middle school student came to TAS from a non-accredited school we would give the student our entrance exam and have an interview to determine if TAS would be a good fit for his/her education. Tell us about TAS’s Advanced Placement Program and its importance in helping students move on to universities. With the school’s recent graduating class, what percentage are going on to universities and where? Chelsea: TAS has a strong AP program that allows students an opportunity to earn college credit while in high school. AP courses are an awesome addition to a student’s transcript and are sure to impress college admissions officers. For the next school year, we will offer the following AP courses: Language and Composition, World History, Psychology, Studio Art, Calculus, Statistics and Physics. Karen: Each of the 20 students of the graduating class of 2018 plan to attend college or university. Some applied to as many as a dozen schools and others applied to only one. The rate of acceptance was very high and students tended to take scholarship and finances, as well as a school’s reputation into account when selecting their top choice. This year, scholarship awards totaled $1,358,700 USD. The following is a list of the schools where the class of 2018 plan to attend: Baylor University, US; Georgia State University, US; Concordia University, Canada; University of Calgary, Canada; Wake Tech College, US; Drury University, US; Royal Melbourne Institute of Technology, Vietnam; University of Sydney, Australia; Monash University, Australia; Northwest Community College, British Columbia, Canada; Hult University, US; Orange Coast College, US; LaSalle College of the Arts, Singapore; and Auburn University, US. Chelsea: In addition, TAS class of 2018 was accepted at more than 40 universities with more than USD1million in scholarships. Some of them even received the acceptance from more than 10 universities. To have this result, Karen’s role is very important. What unique role do you think middle school counselors play in supporting students’ college readiness? How can counselors work to ensure that all students, no matter their background, have the opportunity to access college? Currently in the US, special area courses (PE, Art, Music) are being defunded and closed because they aren’t considered essential to education. What’s your opinion on this and how do these courses contribute to student achievement in general and to the attainment of core curriculum standards? Chelsea: It breaks my heart to hear about the defunding of arts programs at schools in the US. TAS has long-standing Music, Drama, Dance, Arts and Physical Education programs. I have seen how these courses can excite, challenge and celebrate students in ways you can’t always see in the traditional content area classrooms. We are preparing our students for a world where critical thinking and creativity are crucial to success. In the years to come, we will continue to put as much emphasis on the Arts as our general education programs at TAS.